I was craving a proper Iowan corn casserole, as well as something with a mexican flavor, so I came up with this. This is good comfort food, and using lean ground beef and light sour cream keeps it moderately healthy while keeping down fat. 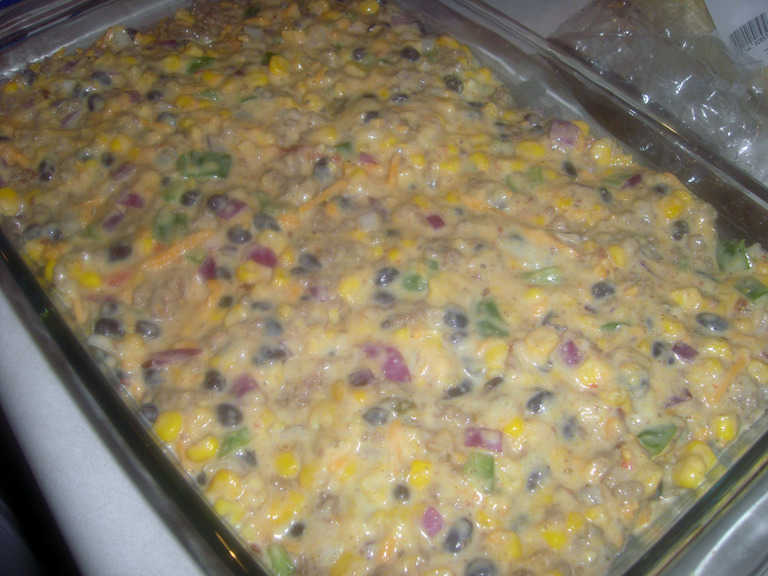 I kept searching for a Mexican corn casserole, but couldn't find anything to my liking. I ended up just taking a basic corn casserole recipe, modifying it, and adding a bunch of Mexican flavors, along with some eggs to tighten it all up. This is a good meal on it's own, or a very satisfying side for a dinner. Easily made vegetarian by omitting the beef. Mix all of the ingredients listed, place in a buttered/oiled 13x9" pan, and bake at 350F for about 50 minutes, or until when you jiggle the pan, the center barely jiggles. I recommend topping with a bunch of crushed, baked nacho cheese doritos before baking. Very midwestern.